It was truly a privilege, inspirational, and wholly refreshing experience to meet U.S. Congress hopeful Ludmya Bourdeau “Mia” Love this week when she visited the Lincoln Club in Orange County. As you may recall, Mia was a relative unknown who lost to Democrat Jim Matheson in Utah’s 4th congressional district in 2012 by just 768 votes. Mia is back again in 2014, and I couldn’t be more pleased as it is people such as Mia that give me hope for the Republican Party and even more, hope for our country that if we put the right leaders in place we can change government for the better. Mia is the child of Haitian immigrants who came legally to the United States with virtually nothing, but took full advantage of the American dream. Their attitude was not to come looking to the government for anything, but simply looking to prosper and give back to a country that provided them with the opportunities they were denied in their own home country. Mia’s parents instilled in her an attitude of hard work, personal responsibility, and love of country, which she has demonstrated in her own career, in her time as City Council member and Mayor of Saratoga Springs, Utah, and has passed on to her own children. Mia has an impressive record of achievement as a council member and Mayor, known for cutting taxes, expenses, and putting her city on a sound financial footing while serving as Mayor. Mia told a compelling story of the building of a library that highlights her refreshing view on how government is supposed to work. Some residents of Saratoga Springs wanted a library with the usual story about how great it would be and how many people it would serve. Before committing any public funds, however, Mia asked the library supporters to demonstrate just how much the community wanted a new library. The community came together, putting on bake sales and various kinds of rallies, raising all of the money needed to build the library with no public funds. You see this rarely, as most politicians (including some Republicans here in Orange County) seize on every opportunity to use public funds to “do something for the people” instead of being prudent with taxpayer money and challenging all efforts to take hard earned money out of people’s pockets. Granted, Saratoga Springs had only a population of 21,000 as of 2012, but the principles of fiscal constraint and limited government stand no matter what the population. If a politician doesn’t believe in limited government at the City Council level, they certainly won’t believe in it as they move to the state and federal levels where there is even greater impetus to spend other people’s money. This quality is imperative and Mia certainly possesses it. Mia is a black woman who fully embraces and values what she is, but she will not allow others to place her in any predefined categories about what a black woman should be or do. Mia forcefully argued how the “hope and change” that Barack Obama promised was nothing more than a false campaign promise. While Obama believes that more and bigger government can make people’s lives better, Mia argues that the best government is the most local government. First, the federal government has limits as imposed by the Constitution, yet involves itself in things it was not designed to do and simply cannot do effectively. That’s why we have so much debt that we are passing on to the next generation. Second, when government does things for people that they can and should do for themselves, people lose the incentive to make their own lives better through self-reliance and thus become more dependent on government. Third, when you look at situations where people’s lives are actually made better, you see this at the local level where people are using their own resources and meeting each other at the point of need. To the degree that government is limited, those resources can stay local and be used locally to make people’s lives better, instead of being funneled up to a fat, bloated bureaucracy that cares little about how people’s hard earned money is spent since they are so far away from everyday problems. So Mia gets it right, while Obama gets it totally wrong. But it’s not just Obama. It’s the other socialist/Marxist Democrats and unfortunately, many establishment Republicans. That’s why we desperately need a new generation of leadership that respects the Constitution and truly believes in limited federal government (i.e., giving the power the federal government has already unconstitutionally amassed back to the people). Mia would have a few like-minded colleagues in Congress such as Mike Lee and Ted Cruz, but what I think is unique about her is her method of communication. Mia recognizes, as I have been arguing for some time, that the biggest problem with Republican politicians is communication. Regretfully, most Republicans today in Washington, D.C. can’t communicate well enough to defend almost any policy position. What we hear are lots of numbers and statistics about debt and deficits, but most American people can’t translate that into something that is meaningful to their lives. That’s why Democrats have effectively brought the “War on Women” back this campaign cycle and Republicans have no idea how to respond. What Mia brings is a personal touch to her communication looking to speak to people’s hearts, and she only then goes after the mind once she has their attention to explain why a particular conservative policy will make their lives better. In so doing, that policy will not be what the government can do for a given person, but how the government can facilitate them doing for themselves at the most local level. Though Mia didn’t mention the term, it’s the powerful Catholic principle of subsidiarity. This principle holds that nothing should be done by a larger and more complex organization which can be done as well by a smaller and simpler organization. It particularly applies to government as a bulwark against centralized bureaucracy and tyranny. I am supporting Mia and I hope you will take a look at her candidacy and support her as well. The incumbent Jim Matheson is not running again so she is the favorite to win. Nonetheless, while her fundraising has been outstanding, she needs much more support to ensure victory in November. Aside from the fact that she would be the first black Republican woman ever elected to the U.S. Congress, which is historical, what should get you really excited are her conservative principles, her energy, and her excellent ability to communicate which will be critical to growing the reach of the Republican Party. Mia breaks all of the stereotypes, and my hope is that she will break the mold of what the Republican Party looks like when she steps into Congress in January 2015 representing Utah’s 4th Congressional District. But not only is she representing Utah, she’s also representing the hopes and dreams of all of the grassroots conservatives who are clamoring for change in Washington. 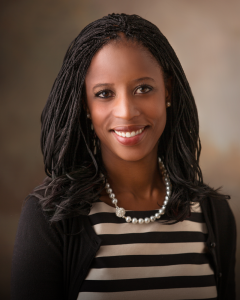 Ludmya Bourdeau “Mia” Love, I believe, will do just that and pave the way for a new, revitalized, Republican Party. Godspeed to you Mia!